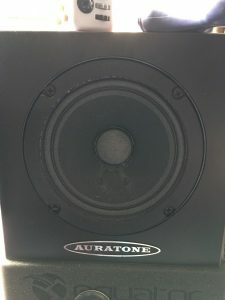 I have used Aux-Fed Subs, and there might even be a post on that somewhere where I probably spoke highly of them. Of course, I stopped using them a few years back because it stopped fitting my mix workflow. I use a lot of groups for both processing and level control when I’m mixing music. I sometimes even use a bit of processing on my Master buss. Since the Aux send to the subs is before the groups and master buss, any processing or changes I make on these doesn’t translate to the subs. So let’s take my drum groups, for example. I use two groups for drums: a clean group and a compressed group. I throw bass into these as well and balance them together for the sound of the rhythm section. With aux-fed subs, the combination of these two groups never touches the subs. So anything I do with my compressed group gets lost below the crossover to the sub drive because the feed to the subs is pre-group. I didn’t like this because part of the benefit I get from compressing drums is it can tighten up the bottom end. But let’s say I can deal with this and still opt for aux-fed subs. So what happens if I want to turn my overall drum level down in the mix? If I pull my input faders down, I’m pulling down the level I’m sending to groups which also turns down the feed into my compressor on my compressed group. 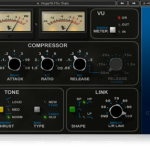 This is essentially the same as me pulling back the threshold of the compressor on that group. So now my compressed group is working differently which in turn changes the drum and bass sound I just got balanced. So I probably don’t want to touch the input faders. If I just pull the group faders back a little, my rhythm section mix/sound stays the same, but the level of that going to the subs doesn’t change. So now the kick drum and bass guitar I’ve probably already spent too much time EQ’ing have too much bottom in the house, and my rhythm section’s sound still changes. So where do I chase that? Do I take some bottom out of the kick and bass on the EQ or do I pull the Aux Send from those inputs down? Well, myself and most guys I know will probably instinctively reach for the low EQ knob and dial it back a bit. But then what happens to the mix in the halls and video control room? What happens on the rehearsal CD mix? Those things might start to thin out in those mixes. OK, so maybe I remember that I need to turn the aux sends down a bit instead when I pull the groups back. 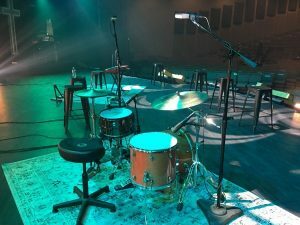 Now what happens when I push the drum groups back up for the fast song that comes next? The process creates a lot of questions when I just wanted to mix the music. In my current setup, I actually send out of my console to the sub drive using a matrix. This makes it easy to reconfigure our house template if there’s someone visiting who really wants to use aux-fed subs because I can just add an aux send to the matrix. Personally, though, I just put the left/right in there. Now, I suppose I could get around some of the stuff I mentioned above if I put my drum/bass groups into the matrix feeding the subs. But then what do I do if there’s a sub-drop coming from the keys or trax? I don’t necessarily have room in those matrix’s to add a bunch of groups with the other stuff that’s in there? And if I use the matrix for sending to the PA, what do I do about sends to Video World and the Hall? Can I still use the left/right? Do I need to split everything up and manually add things to matrixes? What happens with internal bussing latency on the console, and will that mess up my sub alignment? Etc. etc. etc. So I guess my point is that feeding subs with an aux isn’t always cut and dry and can be a little more of a technical thing to deal with than it sometimes seems. Personally, I don’t want to have to think about much technical stuff when my brain is in mixing mode. I’m old school and was taught to use mic placement, high-pass filters, and EQ’s to manage most tonal/frequency things. I have no problem running a HPF pretty high on most things that wouldn’t I wouldn’t want to send to the subs anyways. I’d rather deal with these types of things than worry about routing and bussing on the console. I know a lot of guys who make Aux-fed subs work great because they know how to implement them into their workflow. But I’ve also seen a fair amount of guys get in trouble trying using them because they end up trying to use the aux to manage things that should be managed elsewhere(mic placement, filters, etc.). The thing you’ve got to remember if you’re working with Aux-Fed subs is when you play with the level going to your subs–whether via a channel send or the actual output feeding the subs–you are also playing with your system optimization, and there can be consequences from that. 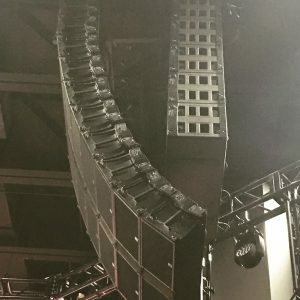 Personally, if I was mixing on loudspeaker systems that I consider lower in quality, I might play around with aux-fed subs a little more to make it work in my approach because it can give better performance from the subs. But I’m blessed with great loudspeaker systems to work on these days, and I haven’t noticed a distinct sonic advantage in my current setting from using an aux-feed for the subs. I don’t want to discourage anyone from using aux-fed subs because they can be a great tool. But just remember the aux-send isn’t the “feel good” knob. You need to know how the system is setup and approach its use properly. This is really helpful and makes me reconsider my workflow in a good way. I’m preparing a big overhaul of my system in April to make it fit me better (inherited a system with very little time before starting a show). Personally i agree with the no subs on an aux too Dave.The biggest thing for me we use our FOH board mix for our web feed so having subs on an aux you tend to loose the low end in your output to recordings. Also i just find if the pa is tuned right and you have plenty of subs then putting subs on an aux isnt necessary and justs adds one more step to mixing and making changes. Always a good reading material Dave. Can i extend this question a bit more, how do you treat your subs on your room? Stereo or mono? and why? I always go mono with subs. The human ear/brain is not good at determining where low frequencies are coming from so I don’t see any benefit from breaking the subs up into multiple channels. 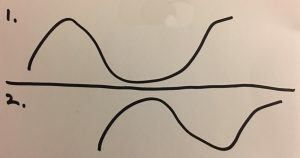 Are you feeding all the zones of your PA via Matrices? I just feed Left, Right, and Subs. Everything else is handled in the system DSP. Hey Dave. 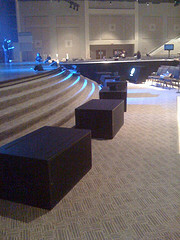 I see you have your subs spread around the base of your stage. Do you fly any subs, or are all of your subs grounded? Currently, everything is on the ground. If I’m not in a really big venue ala an arena or shed, I would probably work pretty hard to keep them on the ground. It’s probably more about coverage for me, and it seems that as soon as they go in the air they end up getting put 50 feet apart which tends to wreak havoc on coverage. There’s a tradeoff to what we do, too, though because by spreading them out around the stage the way we do, we lose impact and punch. I might do a post on this at some point, too. Dave, wouldn’t putting your all your drums channels including your drum groups into a VCA turn down the levels going to the subs?